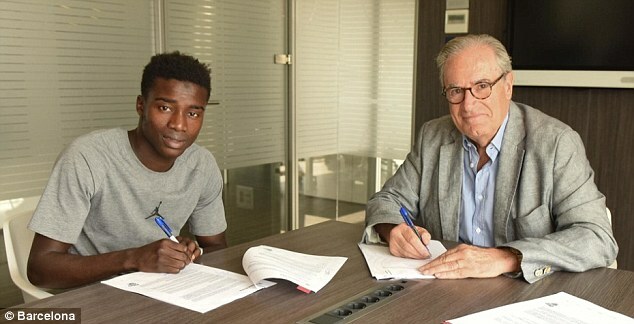 Barcelona have signed Senegalese international footballer, Moussa Wague to join its ranks as a staggering release clause is inserted in his contract. Barcelona have captured the £4.5million signing of Senegal international Moussa Wague from Belgian side KAS Eupen, Daily Mail UK reports. And the Catalan giants have looked to fend off interest in Wague in the future by inserting a sensational £90m release clause in his contract. The 19-year-old right back has signed a five-year contract at the Nou Camp and will join up with the Barcelona B side at the beginning of his spell in Spain. Wague passed his relevant medical tests on Friday, August 3 and he met up with Barcelona president Josep Maria Bartomeu for the first time. Wague impressed at the World Cup in Russia as Senegal agonisingly missed out on a place in the knockout rounds to Colombia and Japan in Group H.
The teenager became the youngest African to score in World Cup history after netting a decent finish against Japan. Wague, well known for his blistering pace, has experience playing in the Europa League and the Belgian top flight with Eupen. In his two seasons in the first team at Eupen, Wague played 23 games in the top flight.